In two and a half years, leftists like Rep. Wasserman Schultz, have changed this country so fundamentally it is not clear at all to what extent we can recover. Florida Congresswoman Debbie Wasserman Schultz, who is also Democratic National Committee chair, suggested that the nasty email she got from her state's Republican counterpart Allen West, responding to her attack on him in the House of Representatives, resulted from him being "under pressure." Of course, Allen West is under pressure. As is every freedom loving American, as we watch our great country sink. In two and a half years, a left wing Democrat president along with a left wing Democrat congress, controlled by the likes of Rep. Wasserman Schultz, have changed this country so fundamentally it is not clear at all to what extent we can recover. In just two and half years, they've increased federal spending a trillion dollars. It took George W. Bush, the largest spender since President Johnson, eight years to accomplish this. The national debt stood at $10.6 trillion when Barack Obama became president. Now, two and a half years later, it's at $14.3 trillion -- a 40-percent increase. Obamacare has nationalized one sixth of the economy. The Dodd-Frank financial services law brings unprecedented government control over our banking and financial services sector. The bailout of General Motors changed the American auto industry forever, opening the door to corporations becoming a subsidiary of the U.S. government. Now in that spirit, the Obama administration is trying to prevent Boeing from relocating plane production from the state of Washington, where unions are crippling its business, to South Carolina, a right to work state. The Congressional Budget Office now projects that debt will equal 100 percent of our GDP in 10 years. Even if Republicans succeed in extracting several trillion dollars in spending cuts from our president in exchange for raising the debt limit, this barely dents the massive new debt build-up. Republicans, like Allen West, who were elected in the 2010 electoral backlash, are trying to do something to save our future. One is the Cut, Cap, and Balance bill that the House just passed, which was the focus of Wasserman Schultz's attack on West. Wasserman Schultz got on West for supporting this bill, calling this a platform for cutting Medicare for the seniors in his district. The threat to seniors is Obamacare. It cuts $500 billion out of Medicare to pay for its new socialized medicine regime. Here's the Kaiser Family Foundation and the Washington Post on this: "Medicare's chief actuary, Rick Foster, estimated that the law (Obamacare) could reduce projected Medicare spending by more than $575 billion over 10 years." And contrary to the grand lie under which Obamacare was sold, that it will save money and cut the deficit, CBO now projects that health care spending under this regime will double by 2035. Every senior in the nation should be trembling about what Wasserman Schultz has helped make law of this land. What should we expect? We have turned our lives, health, and pocketbooks over to the same humble geniuses who told us that $850 billion in stimulus spending would create 4 million jobs and prevent unemployment from going over 8 percent. Today 1.5 million less Americans are working than when Barack Obama became president and unemployment stands at 9.2 percent. West explained the vitriol of the left toward him, one of two black Republicans in the House, as stemming from his "being the guy that got off their 21st century plantation." It's more. They are also obsessed with getting the whole nation on it. And Wasserman Schultz and her left wing friends in government are succeeding. Of course Allen West feels pressure. Every American who cares about their job, their future, and their children's future is stressed out. 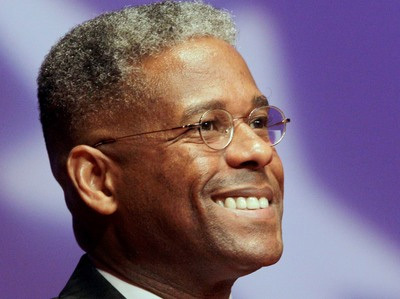 Given the damage inflicted by Wasserman Schultz and her party to our nation, Allen West has been quite the gentleman.